Finding ways to sneak science and fun in at home can be super rewarding as a parent. 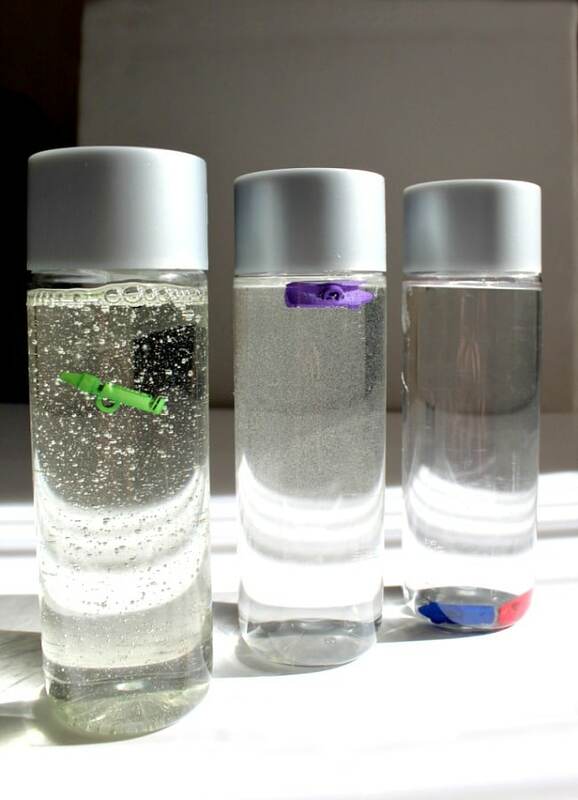 This science sensory bottles experiment provides your child the chance to explore the concept of density through colorful crayons and water bottles and a little mystery materials. Plus it gives them a chance to simply learn the art of observing and problem solving on their own, which is a win in my book. 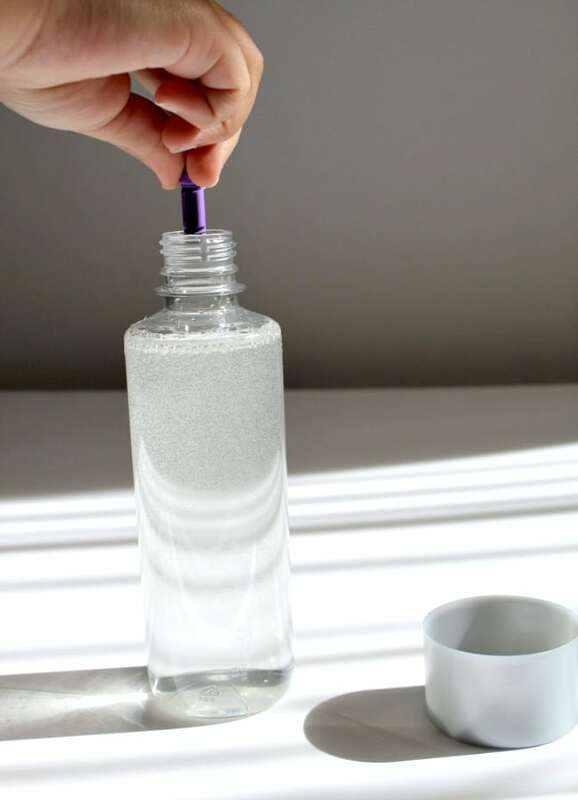 Here’s how to make your own Science Sensory Bottles. Are the crayon buttons moving? Will that little drop at the top fall down? What is this make of? Are these questions going through your thoughts right now too? That’s exactly why you need to create this science sensory bottle experiment with your child too. 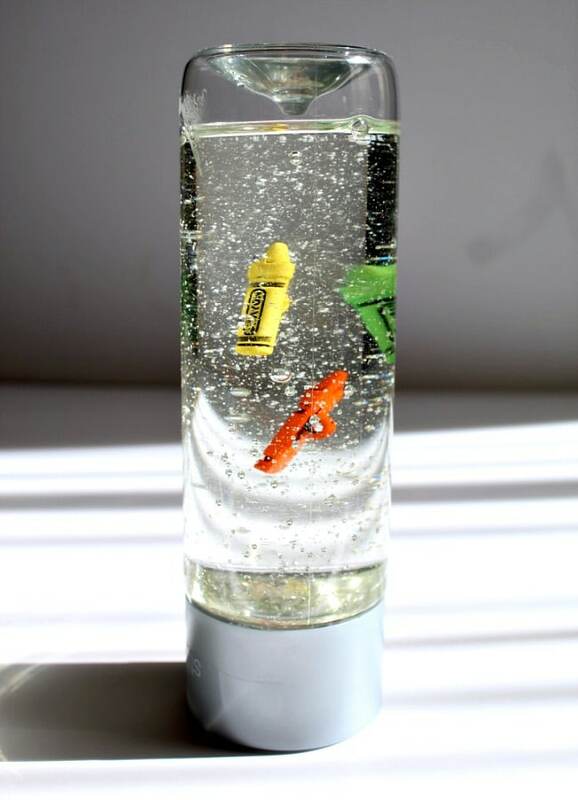 My kids literally spent hours with my creating the bottles and exploring how they work. Using clear Corn Syrup was a first for us at our house, which led to some great nutrition conversations too. Here’s what you need to make your own. Gather your materials with the kids, which are just a few things and get started. I recommend filling the science sensory bottle in the following order to make the most out of this science experiment. 1. Have your child fill one empty bottle with water. Leave some airspace for the water to move around. 2. 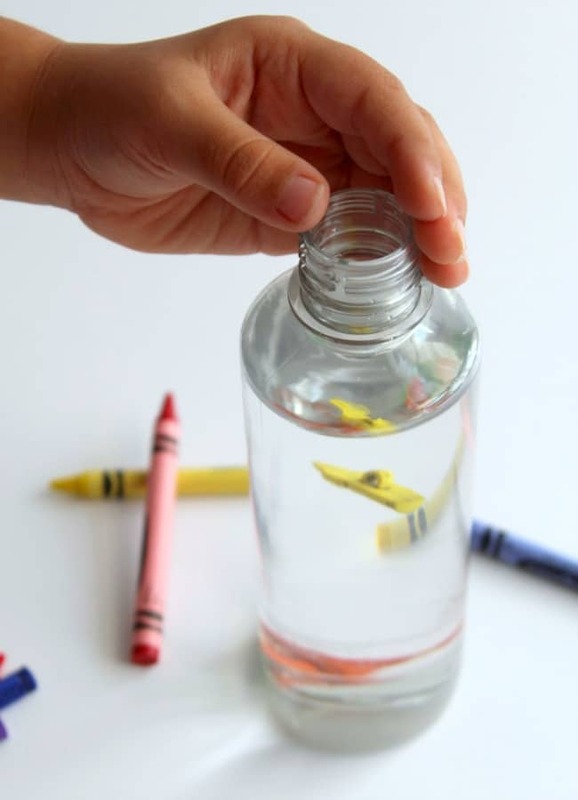 Then add a few of the Crayon Buttons into the water bottle. Screw the lid back on tightly to avoid spills and leaks. Can you control where they go? What is the density of the liquid like? 4. Now fill the 2nd empty bottle with corn syrup with your child. This alone is a super fun experience as it drips in a small smooth stream into the empty bottle. My kiddos loved the air bubbles that were created in the process too. Be sure to leave some airspace for the corn syrup to move around with. 5. Add a few Crayon Buttons into the corn syrup container. Seal the container tightly to avoid spills or leaks. Ask the same questions again from Step 3. Is the density different from the water? 6. 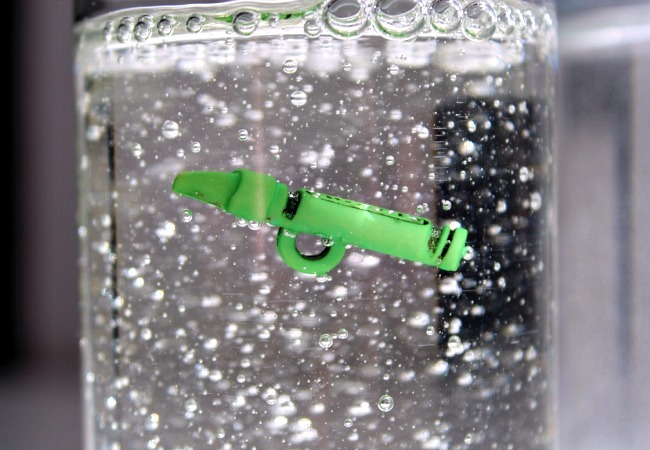 Shake the science sensory bottle filled with corn syrup up to add air bubbles to it. Are the answers to the questions the same? 7. Now it’s time to see what happens when you add half water and half corn syrup. Visually the corn syrup pouring into the water is quite a site. Go super slow so it lasts longer. Pause and allow time for your child to observe the contrast in density. 8. Add the Crayon Buttons into the corn syrup and water mixture and see what happens. 9. SHAKE the combined science sensory bottle to see what happens with the corn syrup and water mixture. Be sure your child really sees what happens. Ask the same questions again from Step 2. 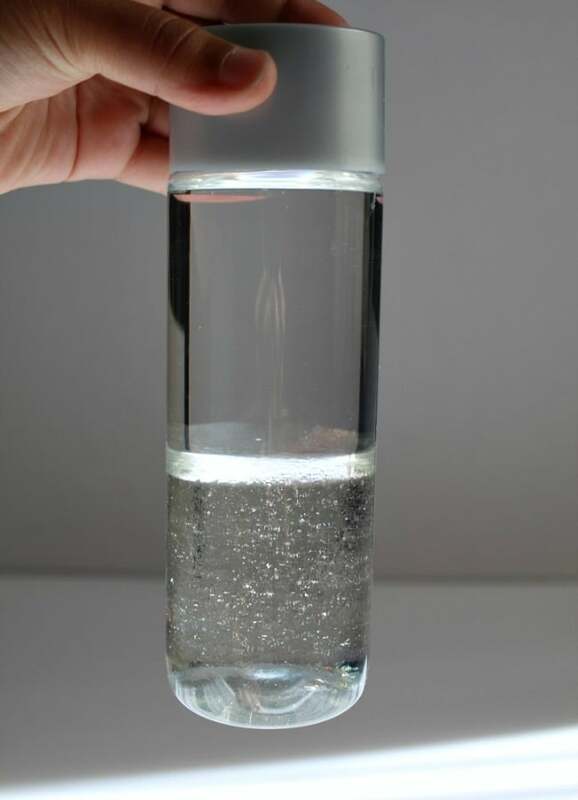 I’ll admit it, I was quite surprised with a few of the reactions we were able to create when we varied the density of the liquids and my kids were totally intrigued. This science sensory bottle experiment gives your child so many opportunities to observe and explore the density of liquids. Do the crayons float, sink or remain the same? The answer might surprise you! BONUS IDEAS: You could add additional liquids into new bottles to see how they react as well. The first one I would try would be vegetable oil. Or try a different material like metal or stone or glass to see if the reactions are the same. 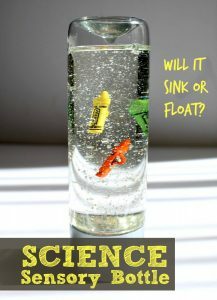 If you’re looking for more ideas like this science activity for kids. 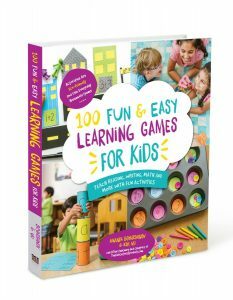 GRAB A COPY of our new book 100 Fun and Easy Learning Games for Kids! Want more Crayon Themed Sensory Bottle FUN? 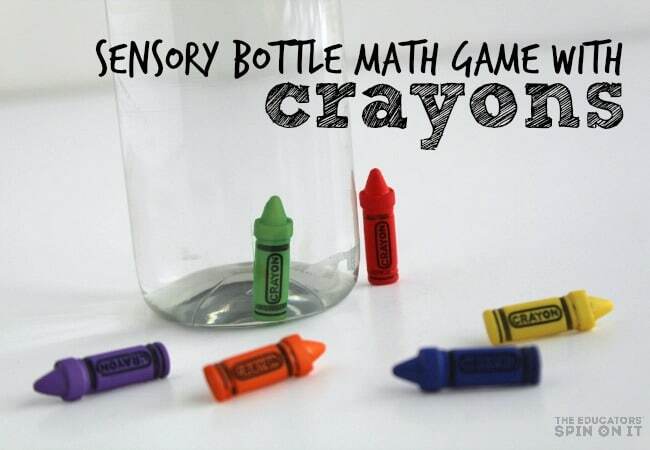 Try this Math Game with the same bottles and crayon buttons. « Win a Multicultural Children’s Book Bundle for your School Library! Looks fun but why crayon buttons? Could I use normal crayons, or just normal buttons? Thanks. Good question… we wanted something more permanent for our crayon themed activities, would love to hear how your normal crayons turn out with your experiment. I’ll have to test it out too.